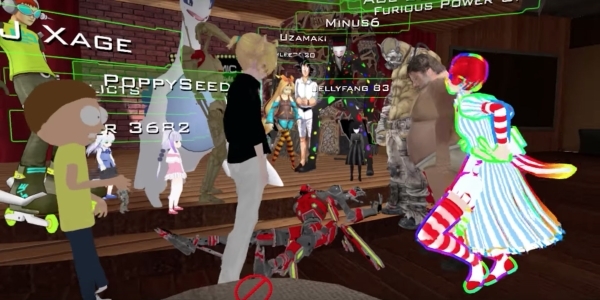 While playing around in VRChat, an online virtual community, YouTuber Rogue Shadow VR noticed a player who appeared to be in trouble. His character — a red and black robot — was writhing on the floor and gasping in what appeared to be an epileptic seizure. In the original video, spotted by Motherboard, Rogue Shadow VR explains that because the player had full body tracking, those in the online room were suddenly bystanders to his real-life dilemma. “There was no way we could tell at first, because all we see is this character he’s playing as,” Rogue Shadow VR says. VRChat is a strange platform to begin with, one where players can appear as any avatar they make, from pokémon and Rick & Morty characters to imagery from problematic memes. It’s typical for players to goof off or otherwise act out of turn. But players soon realized that this incident was not a prank, but a person experiencing real distress. Many asked aloud “Is he ok?” while others wondered what to do. Without knowing who the person was, however, there was little they could do but watch. Eventually, the player began to recover and respond to their questions, while they tried to comfort him. Although online spaces can be notoriously hostile, especially within the gaming community, the majority of players seemed genuinely concerned when confronted with the reality of a person in trouble. While a few ignored the seizing player or continued making jokes, most voiced their concern and care. “Be safe,” one says as the player logs off. Many seem shaken after the incident. A full version of the incident without commentary has since been uploaded to Rogue Shadow VR’s channel. According to Rogue Shadow VR, both videos have been uploaded with the permission of the player in question. “This video is being shared for the purposes of spreading awareness of epilepsy which must be considered with the emergence of virtual reality on both the industry and individual users scale,” the video’s description says. “This is also being shared for the purpose of analyzing and documenting the nature of this occurrence and the reactions of bystanders in Virtual Reality which is an unprecedented situation.” Rogue Shadow VR says he caught up with the player afterwards on Steam, and that he is doing better now. Virtual reality opens up more physical interactions and relationships than any other online space has before, though it typically masks people’s faces and physical locations. Although players may be able to see someone in trouble, there’s really no way to help them.